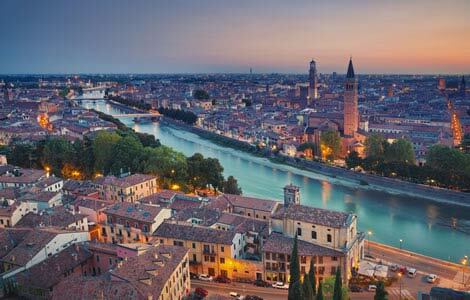 During your holidays at Hotel Castelli you can find out with us what to see in Verona, Padua, Venice and Lake Garda. The destinations close to our facility are so many and are worth visiting for a variety of reasons. We have thought of helping you make the right choice with a few little personal suggestions. 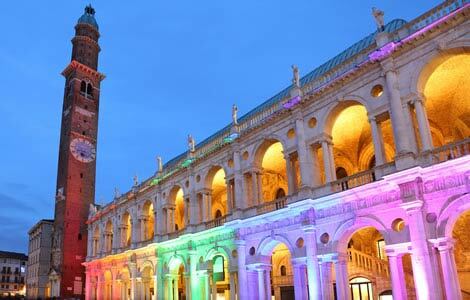 Vicenza was declared Universal World Heritage Site by UNESCO in 1994 and is famous for its architectural works designed by Andrea Palladio. We can admire his art in several buildings, such as the Basilica Palladiana and the marvelous Loggia del Capitanio. Other works by Palladio that are worth mentioning are Palazzo Chiericati, Palazzo Barbaran da Porto and Palazzo Valmarana. Of particular interest is the architectural work of the Olympic Theater, completed by Scamozzi. Outside Vicenza, we recommend the famous country house Villa Almerico-Capra, known as La Rotonda, and the Basilica di Monte Berico, which houses precious works, including Veronese’s painting “The Supper of Saint Gregory the Great”. 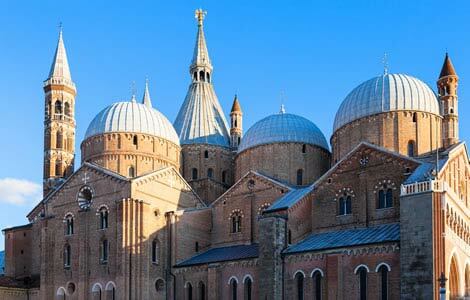 Padua is past and present, tradition, art and millenary history. This city houses works such as the Scrovegni Chapel and its cycle of frescoes by Giotto, Donatello’s sculptures and the modern Libeskind’s monument. 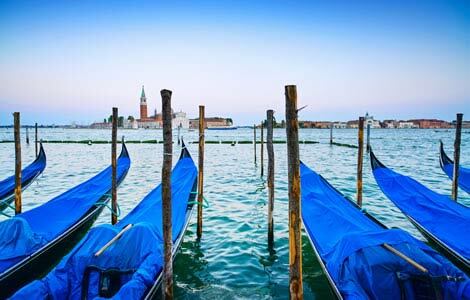 Venice is formed by an archipelago of 120 islands, enclosed in a lagoon, between the coast and the open sea. It is one of the most beautiful and famous cities in the world, offering a dreamy and romantic atmosphere. Here you can admire St. Mark’s Square, the pulsing heart of the city, its Basilica built in the oriental style with Byzantine domes, the prestigious historic palaces of the Procuratie Vecchie e Nuove (Old and New Procuracies) and the Doge’s Palace. A trip to Venice must absolutely include a walk on the Bridge of Sighs, a romantic gondola ride up the Grand Canal and a walking tour on the ups and downs of bridges and narrow streets, to discover the treasures of Baroque Santa Maria della Salute, the Galleries of the Academy and the Scuola di San Rocco with the extraordinary cycle of Tintoretto’s paintings. The city of love, which has always been considered the city of Romeo and Juliet, has been marked over time by different eras and architectures: from the Roman settlement to the time of the Scaligeri Lords and the Venetian and Hapsburg rules. The city’s symbol is the Great Arena in Piazza Bra, while Juliet’s House, standing a short way away, has always been visited by lovers from all over the world leaning out of the famous balcony. Piazza delle Erbe and the Cathedral, which houses the famous Tiziano’s altarpiece, are also worth visiting. 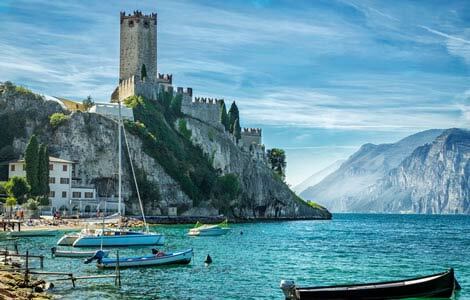 Lake Garda is surrounded by villages, castles, monasteries and ancient towns, characterized by a special atmosphere. Among the most beautiful and characteristic we mention Desenzano, Sirmione and Bardolino. Among the many palaces with scenic gardens, the majestic Vittoriale is a must-see. The home of Gabriele d’Annunzio, it is located in Gardone Riviera, a town rich in liberty architectures, which also houses the André Heller Botanic Garden, with its over 2,000 varieties of plants.